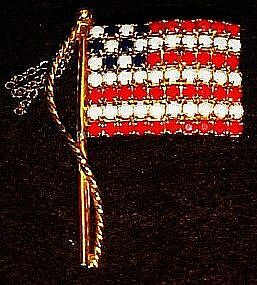 Pretty opaque rhinestone s of red white and blue on this great flag pin. Appears to be waving. Little gold chains at the top that move when you do, and gives more of an illusion of a waving old glory. Stones are in a gold tone setting. Unmarked. Measures 2 1/8" and is in perfect condition.